On May 13, LIA submitted written demands to the Agricultural Administration Office of the Ministry of Agriculture, Forestry and Fisheries regarding the treatment of the animals in the area around the Fukushima Daiichi nuclear plant. 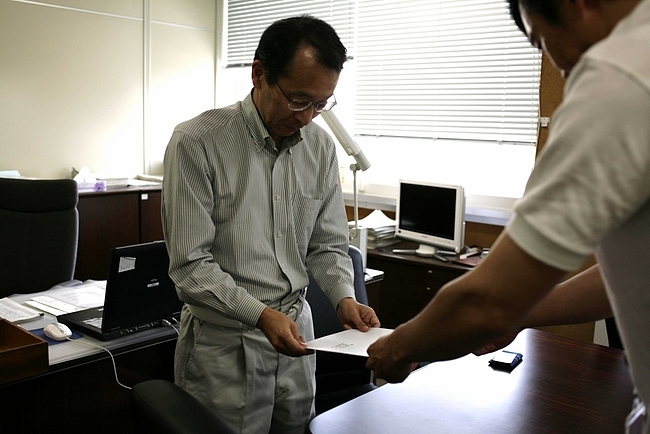 The Executive Director of LIA submitted written demands regarding the treatment of animals in the 20km ‘no-go zone’ in Fukushima Prefecture to the office of Norio Sato, head of the Touhoku Agricultural Administration Office of the Ministry of Agriculture, Forestry and Fisheries (MAFF) on May 13, 2011. Unfortunately, Mr Sato was out of the office at the time but we met with the office chief Taizoh Hakamata and other staff and exchanged views on the plight of the animals in the area. Although the Prime Minister has announced how animals in the affected area were to be dealt with by putting them down, in practice the decision-making power over the fate of abandoned domesticated animals lies in the hands of each prefecture, town, village and the animal’s owner, who all have the ability to veto. Touhoku Agricultural Administration Office informed LIA that the slaughter of animals in the 20km ‘no-go zone’, announced by the Prime Minister, was still not enforced and they did not know how to proceed with this or who would carry it out. Touhoku Agricultural Administration Office said that dealing with livestock in the area would be delayed by a month, but how they were to be dealt with has been decided. Dairy cattle were to be slaughtered. Cattle bred for meat would be screened for their safety for consumption and then slaughtered in slaughterhouses as usual, but it might also be possible for them to be transferred to stock farms and sold at auction if they were deemed fit to live in another place. Any meat for human consumption produced from animals originating in the affected area but transferred elsewhere before slaughter would be labelled as produce of the area they were transferred to, not as produce of Fukushima, but it would be possible to track animals by individual identification numbers. Touhoku Agricultural Administration Office said that pigs and chickens in the area would be transferred to the owner’s affiliated farm until they are slaughtered. Touhoku Agricultural Administration Office said that for pets recovered from within the 20km no-go zone, radiation would not be an issue once they were screened and decontaminated and that half of the radioactive materials would be released from their bodies within 80 days.